I've worked with professionals, as well as parents, who, in their upset, say they just don't think they can love or help certain children. My response is simple: begin with compassion. I understand fully how challenging it is to feel love toward a child who walks through the door with the "difficult" factor. Compassion moves you right past what's difficult and on to matters of the heart. When you make an effort to see through the glazed-over look in these children's eyes, straight into their hearts, you will find your way. It's the affirmative connection that begins healing the negative beliefs these children embody. 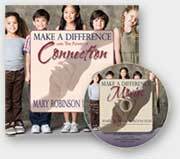 I wrote Make A Difference with the Power of Connection because without connection you won't succeed with today's students offering us all the opportunity to think differently. As a teacher who later became a counselor, I learned to keep it simple and straightforward. How the child was labeled at birth through his or her first five years of life, including both parent labels and school-related labels. When working with parents, what was going on in the parent's life that the child could be carrying a symptom for. If working with a teacher, what emotional buttons this child pushed for the teacher - necessary to determine how to best align the teacher with the child. If I didn't readily see what needed to happen, I kept listening until I did. Wait for it. You must learn to resist the urge to analyze and fix too fast. When a problem seems so big that you don't even know where to begin, wait for it. Lean into the knowledge that connecting with compassion provides. Compassion offers a message that is universal. It is unifying, because it transcends the need to use force to counter unacceptable behavior that arises in disturbing circumstances and situations which an individual feels are beyond his or her own control. We've all thought from time to time, "I just wish so and so would learn to be caring - or 'generous' or 'accommodating' - to others, and be more connecting and compassionate." We somehow expect people who have no frame of reference to figure it out and "get with the program." It is not until we investigate a situation that we will be able to understand the reasons for unproductive behavior. Only then are we able to tap into the power of compassion, to change the life of a child. And therein lies the rub. This is where we are presented with opportunities. Everyone can see that it's all about how "they" are behaving unskillfully. We tell ourselves that we have nothing to do with how horrible they are. They can't be changed. They will never get it. And yet, adults and children both are deeply affected and, yes, even changed by a simple act of compassion. Connecting compassionately is all about how a simple shift in perception can bring new energy to any troubling situation. It's not about telling already stressed-out administrators, educators, or parents that they should be trying even harder with a child who is struggling. Trying harder, in and of itself, sends an attitudinal message to the child that says, "Because you are so hopeless, I have to try so hard to get you to get it!" This sets up a shame-and-fear cycle which compounds an existing problematic situation. Force, shame, coercion, labeling and expulsion never did work - and never will work to create long term, life-enhancing solutions. To learn more, take 30 minutes, read my book in its entirety and see what a difference a book makes! Click Here to read.